Do you regularly cook foods for people in your family that you yourself don't eat? I do. Turkey burgers. So when we have burgers, I usually make Jeff a turkey burger and me a hamburger. The last turkey burger I made for him, I topped with sauteed apples, Gruyere cheese, and sage mayo. After the first bite, he said, "Oh, God, this is good." I nodded, smiled, and took a big bite out of my hamburger. He took another bite. "Sue, seriously, you've gotta taste this turkey burger. It's awesome." "But, I don't like turk--"
"Just one bite. Come on." I took a small bite. It was a revelation! I liked it. I took a larger bite. I loved it! The warm, tart apples, sweet, salty Gruyere, and creamy sage mayo made this turkey burger seem, well, not like a turkey burger. I took a bigger bite. "Um, how much of my turkey burger are you gonna eat, hon?" Jeff asked me. I slid the plate with my hamburger towards him, smiled, and took another bite of his turkey burger. I highly recommend washing down these turkey burgers with a cold, strong beer, such as Guinness or a good Ocktoberfest. 1. In a small bowl, stir all ingredients for sage mayo; set aside. 2. Place turkey in a bowl. Season with several shakes of salt and black pepper. Mix in Dijon. Form two equal sized burgers. In a large skillet over medium-high heat, warm 2 teaspoons olive oil. Add burgers. Cook 3-4 minutes per side, until browned on the outside and cooked all the way through. 3. In a medium skillet over medium-high heat, warm remaining 2 teaspoons olive oil. Add onions. Saute 3 minutes, or until lightly browned. Add apples. Saute 3-5 minutes, or until lightly browned and tender. Season with salt and black pepper. Remove from heat. 4. Once burgers are almost done, top each with 1 ounce of cheese. To assemble burgers, spread half the sage mayo on the inside of a roll. 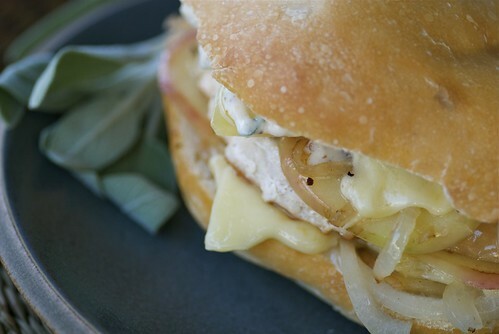 Place burger on the bottom half of the roll, and top with half the onion-apple mixture. Close the sandwich. Repeat. Serve hot. mmmmm, this has now been added to my weekend agenda. i love turkey burgers. glad you found one you like! Wow, that sounds marvelous! An awesome combo! It took me .5 seconds to bookmark this. It sounds amazing. And then I saw the photo and KNEW I had to make it!! Chacka chacka shumishicka! If you are wondering what that was--that is the sound I make when I am stunned. This is to die for. They look so good! I only seems to cook turkey once a year, should try to make this burger as it is so lean and still delicous. You had me at Sage Mayo! Love the sound of this. I love it when there's dialogs in your posts! We never eat burguers at home but your pictures are shouting BITE ME!!! I have my feet firmly planted in both camps and can swing from chicken, turkey, lamb or beef burgers at will.The apples and sage are what transform this to sensational!!!! In my local markets, I'm seeing 93% fat-free and 99% fat free ground turkey. Would you use the 93%, so there would be a tiny bit of moisture in the turkey meat? That's the one I use for burgers; I use the 99% fat free in soups. Turkey burgers have always seemed to be missing something - oh yeah, the BEEFINESS! But this sounds wonderful, I love the idea of the apples and gruyere. Making this, most definitely! We're all about turkey burgers in the kitchen here. Although my meat-loving child would likely scorn the combination that won you over, I know I would love it and next time we make burgers, I'm all over that. 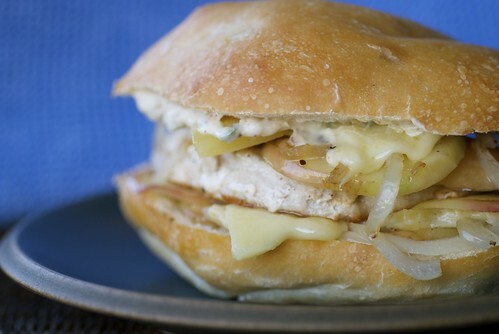 We're all about turkey burgers, so this recipe is a must make for me. Thanks for sharing it! I have never found one that I like. This could be it. Thanks for stopping by today. Oh god, I HAVE to make this! Gruyere is my FAVORITE cheese right now. I've eaten a full dinner and this is already making me hungry again. Mmmm, well done. Well done. I second that! You had me at sage mayo.I love turkey burgers, but you really have to season them up, or just serve with great condiments like yours! I think this photo/recipe may change my life! I like a good turkey burger, but the combo of apples, gruyere and sage mayo really sounds "life altering!" I do like turkey burgers to start with and I love this "gourmet" version! smellls gooood!! absolutely mouth watering!! great combo! cheers and have a great week end!! Oh Susan, I cook so many things that I don't eat! But I have to tell you that I'd easily accept one of those burgers. Sounds like a truly yummy combo! This sounds amazing! I think it is enough to convert any red-meat-eater! brie-I'm happy to hear it! sues-Wow! You made my day! happycook-I hope you try it! nuria-That's the first time "bite me" has had such positive connotations! val-Oh, thank you so much! lydia-I think it was 93%. Though I have made them with 99% too. grace-According to these comments, it is a place of bliss! kate-Yeah, maybe you should make it on a night when he's sleeping over a friend's house. lynn-I'm happy to hear it! theteachercooks-This may be the one. And, you're so welcome! jessie-It is a lovely cheese, isn't it? danielle-Yeah, I love the firm texture of ciabatta. marie-You are right about the seasonings. TW-Yay! I'm thrilled to hear it. nora-Oh, thank you so much! suzana-Then treat yourself to some of your faves this week! Sage mayo! That's what caught my eye. It sounds fabulous! I could do this without the bun and be quite a happy camper provided I slather on the sage mayo. Thanks Susan! I've been doing thinly sliced apples on just about everything these days. This sandwich would be very hard to say no to! Turkey burgers are my favorite, and this sounds amazing. My sage survived the summer heat, so I have plenty for the mayo. I love turkey burgers! I'll have to try your flavor combination here. I'm going through an apple kick and I have some sage that I can mix with some mayo. Great idea! christine-I am addicted to that sage mayo! theleftoverist-Who can help it, right? anali-It seems lots of us are on an apple kick! I recently began reading this blog and just wanted to say I made this last night for myself and my extremely picky, never tries new things, boyfriend. And it was a hit! I made the mayo from scratch - super easy and since we don't eat mayo regularly, just enough for the burgers and a bit left over. And the market I get my ciabatta rolls from was closed so instead I used a hearty whole grain english muffin. Easy and quick burger packed with a ton of flavor. Well done! mmmm this is something i have to try!! My boyfriend who is so picky, only likes really spicy food and "doesn't like turkey burgers" said this may have been the tastiest thing I've ever made. I was waiting for him to complain about the dinner and he loved it! The rolls we bought were a little too tough, so that seems to be the only pitfall. This will certainly get added to the dinner rotation. Also I use pink lady apples (IMO the best apple ever) and added a bit of extra mustard, sage and a dash of cider vinegar to the mayo, and a little garlic and extra mustard to the turkey since we like our flavors pretty bold. AAAAAA-mazing.